Though I just recently began posting, I actually decided to start this blog in April. Since then I have been incredibly inspired in the kitchen. My interest in cooking had been growing steadily over the last few years, but there were still some dishes that I had trepidations about tackling. Since I made up my mind to start writing about my kitchen exploits, however, I have been imbued with a new culinary confidence, ready to take on my kitchen phobias. My most consistent cooking fear revolved around dough (I mentioned this in my opening post). I was comfortable when it came to most cakes and quick breads, but any recipe that included yeast or required kneading or rolling-out (shudder) filled me with anxiety. Since I have had this blog related burst of inspiration, though, I have made croissants, multiple pizzas, fresh pasta, and enough bread to raise our air conditioning bill because of the constant heat from the oven. 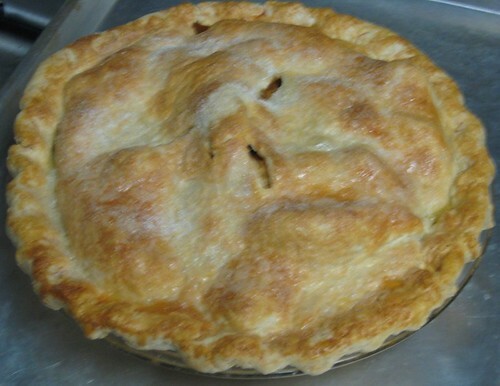 Still, there is one dough-based dish that still strikes fear into my heart: pie. 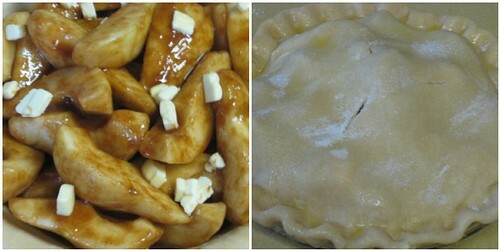 Oh yes, the thought of making pie dough fills me with dread. You see, pie dough has been my nemesis. In a previous post I briefly touched on these issues, but I didn't expound on the problems that I have had. I have made quite a few pies in the past, and while my crusts were, for the most part, passable, they were far from perfect. My crusts were sometimes soggy, always tough, either pasty white or overly brown. And flaky, that adjective which is bestowed upon the very best of pie crusts, would never, ever be used to describe one of my "masterpieces." As an admitted perfectionist, this absolutely rankled. Still, I am not one to give up. But after a disastrous attempt at Smitten Kitchen's peach and creme fraiche pie (the sides of the crust sunk down underneath the filling), I was almost ready to throw in my rolling pin. Then came the aforementioned September alphabet issue of Gourmet (at this rate I am going to end up cooking my way through the A-Z recipe list). When I saw the Pear Butterscotch Pie I was somewhat uncertain because pears and I have had quite a volatile relationship. When I was little I absolutely despised them, but now I can think of few fruits that taste better than ripe, juicy pears. I love them raw, but I had never tried baking with them because my juvenile pear prejudice popped up when it came to cooking. I decided that making this pie would give me the opportunity to put that to rest, and to give crust-making one more go. Before I set about making this pie, I did some dough research and thought about how my crusts had gone awry in the past. I figured that my issues were a result of some, or all, of the following issues: too much flour, too much water, letting the crust get too warm, and overworking the dough. I did my best to avoid these missteps; I kept my butter very cold, left larger chunks when I cut it into the flour (I had to fight the urge to make it all uniform), added only enough water to make the dough just come together (or so I thought), being careful not to handle it too much, and stashed it in the fridge to firm up before rolling. I was feeling really good about myself until I attempted to roll out the dough and it just crumbled. I was disheartened, but I grabbed more ice water and plunged ahead, sprinkling it over the dough crumbles and folding with my bench scraper until it actually came together. After another quick chill the dough was ready to go and I was able to roll out my dough rounds. I breathed a sigh of relief after I slid my assembled pie into the oven, but I was still a bit nervous about the final product. When I pulled my pie out close to hour later, my heart did a little leap at the lovely golden crust, and when I finally cut into the cooled pie and tasted it, I almost wanted to cry (as you can probably tell, pie making turns me into quite the drama queen). Flaky. Finally, a tender, flaky crust. Rich, buttery, and yes, I will say it again, flaky. I will admit to a bit (okay, an exceeding amount) of basking in the glory of my pie crust. As for the pie filling, I do think that "butterscotch" is a bit of a misnomer. This could, however, be due to that fact that my experience with butterscotch flavor comes from hard candies and pudding from a box. Overall, I thought the flavor was similar to apple pie, though I think that is largely due to the cinnamon and nutmeg used in the filling. I liked that the recipe called for the pears to be cut into thick wedges, as opposed to the thin slices that are often found in apple pies. 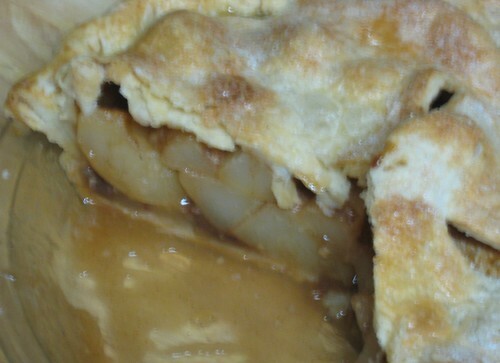 The large chunks of pear added some textural interest to the pie, and kept the pear flavor at the forefront. One minor issue I had was that when the dark brown sugar, flour, and spices baked together, it created a sort of sludge on the bottom of the pie. I know that sounds horribly unappetizing, but "sludge" is the first word that popped into my head when I saw it. It was delicious, just not the most visually appealing. But sludge be damned, at that moment I felt like a pie superstar. Put a baking sheet on middle rack of oven and preheat oven to 425 degrees. Whisk together flour, cinnamon, nutmeg, and salt, then whisk in brown sugar, breaking up any lumps. 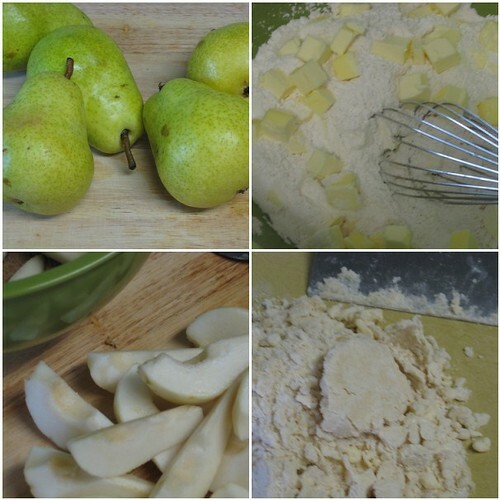 Gently toss pears with brown sugar mixture, lemon juice, and vanilla and let stand 5 to 15 minutes to macerate fruit. Roll out 1 piece of dough (keep remaining disk chilled) on a lightly floured surface with a lightly floured rolling pin into a 13 inch round. Fit into a 9 inch pie plate. Roll out remaining piece of dough into a 13 inch round. Transfer filling to shell. Dot with butter, then cover with pastry round. Trim edges, leaving a 1/2 inch overhang. Press edges together to seal, then fold under. Lightly brush top crust with some of the egg wash, then cut three (1 inch long) vents. Bake pie on hot baking sheet 20 minutes. Reduce oven to 375 degrees and bake until crust is golden and filling is bubbling, 40 to 45 minutes more (mine took longer). Cool to warm or room temperature, 2 to 3 hours. Gourmet's note: Pie is best the day it is made but can be baked 1 day ahead (I thought it was even better out of the fridge the next day, but I love cold pie). Blend together flour, butter, and salt in a bowl with your fingertips or a pastry blender* (or pulse in a food processor) just until most of the mixture resembles coarse meal with some roughly pea-size butter lumps. Drizzle 6 Tbsp ice water evenly over mixture and gently stir with a fork (or pulse) until incorporated. Squeeze a small handful: if it doesn't hold together add more ice water, 1/2 Tbsp at a time, stirring (or pulsing) until incorporated, then test again (do not overwork mixture or pastry will be tough). Turn out dough onto a lightly floured surface and divide into 8 portions. With heel of your hand, smear each portion once or twice in a forward motion to help distribute fat. Gather dough together, with a pastry scraper if you have one, and divide into 2 equal pieces. Press each piece into a ball, then flatten into a 5 inch disk. Chill, wrapped in plastic wrap, until firm, at least 1 hour. Gourmet's note: Dough can be chilled up to 3 days. *Confession: I don't have a pastry blender, so i used a large whisk to cut in the butter. It might not be the best for my whisk, but I found it more effective than trying to cut in the butter with 2 knives, and I didn't want to melt the butter by using my fingers. you have mastered crust and made a gorgeous pie! a superstar, indeed! My first comment! This makes me ridiculously happy. I am completely envious of the gorgeousness of your site.